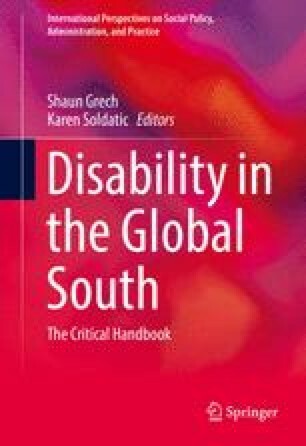 European imperialism constructed disability across the global South in profound, albeit not universal, ways. Whether by direct administration, settlement, and/or neglect, colonial rule created new ideas about and categories of (dis)ability. As shown in Kennedy and Newton’s chapter (2016, in this volume), colonialism also ushered in new somatic experiences of impairment through the sheer violence of conquest, the importation of new diseases, the destruction and appropriation of indigenous land bases and resources, and the exploitation of the very bodies of the colonized for labor. Cuadros, J. H. (2005). The status of disability in Colombia and the importance of parental perceptions on the development of special education. TEACHING Exceptional Children Plus, 1(5). Retrieved September 19, 2014, from http://files.eric.ed.gov/fulltext/EJ966524.pdf. Kumar, A., Sonpal, D., & Hiranandani, V. (2012). Trapped between ableism and neoliberalism: Critical reflections on disability and employment in India. Disability Studies Quarterly, 32(3). Retrieved from http://dsq-sds.org/article/view/3235/3109. Portuondo Sao, M. (2004). Evolución del concepto social de discapacidad intelectual. Revista Cubana Salud Pública, 30(4). Retrieved November 20, 2013, www.bvs.sld.cu/revistas/spu/vol30_4_04/spu06404.htm. Silva, A. (2003) Da fisiologia à biopolítica: discursos sobre a deficiência física na legislação brasileira. Revista Polis e Psique 1(1). Retrieved from http://www.seer.ufrgs.br/PolisePsique/article/view/23653/15179.